The article will aid you to remove .Jaff File Virus effectively. Follow the .Jaff File Virus removal instructions at the end. The .Jaff file virus is ransomware that encrypts data on your computer if it gets infected. Rumors about it being connected to the infamous Locky ransomware have dispersed after malware researchers have denied that being true. 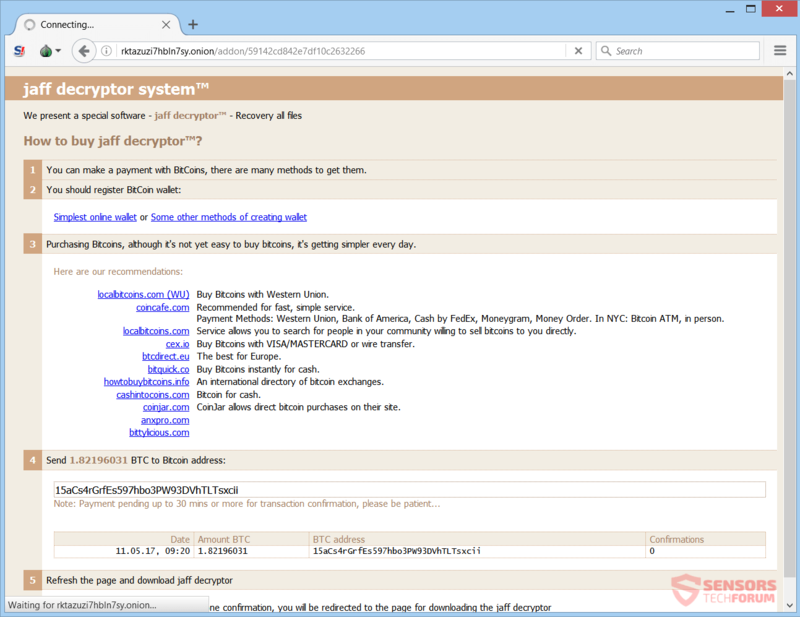 .Jaff will be the newly-appended extension to all files after they get encrypted. What is notable about the Jaff cryptovirus is that it copies some things from Locky like the payment page design, the way it spreads etc. Read on to see how you could try to potentially restore your files. Short Description .Jaff file virus mimics the distribution ways of the newest Locky ransomware variant making it successful in its infection. Symptoms The virus will encrypt your files and append the .Jaff extension on your files after it finishes the encryption process. User Experience Join Our Forum to Discuss .Jaff File Virus. Update! 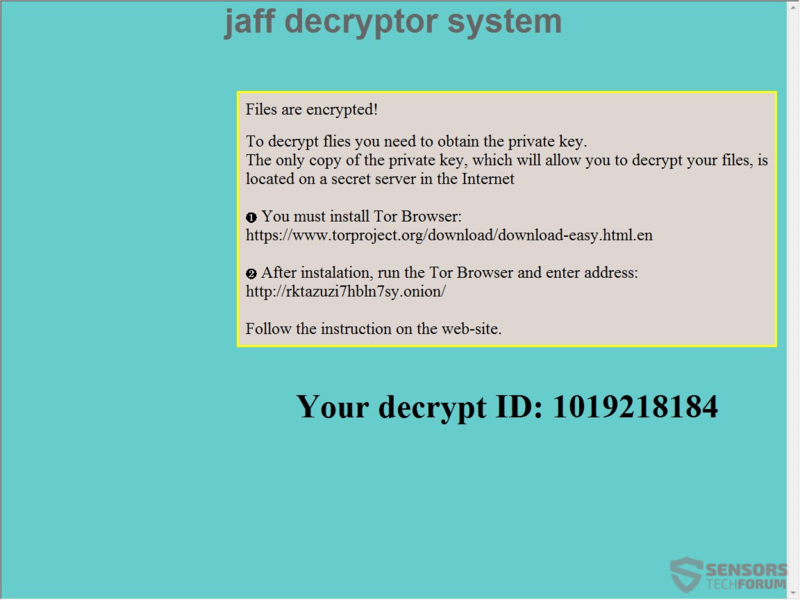 A decryption tool is now available for the .Jaff File Virus! The tool is developed by Kaspersky and called RakhniDecryptor. It can be downloaded from the following link, wrapped inside a .zip archive: RakhniDecryptor. Jaff ransomware not only utilizes the same distribution method used by the latest Locky virus, but it even surpasses it. That could be due to the probability of using another method for distribution alongside the ones it copies. Adding more to it, Jaff also copies the obfuscation (a tactic for malware to hide itself better) from the same source (Locky). Down here the distribution, extraction and infection ways of the .Jaff file virus will be explained. Spam e-mail campaigns are in play, spreading millions of emails, which have PDF files attached to them. Jaff ransomware could also be distributing its payload via social media networks and file-sharing sites. Refrain from opening files after downloaded them, especially if they come from places such as suspicious emails and links from an unknown source. Beforehand, you should scan the files with a security program, at the very least. .Jaff file virus is ransomware, dubbed after the extension it places on files, after it encrypts them. Many have argued that it is a variant of the notorious Locky ransomware virus (.Loptr), due to the similarities between them. However, that has been proven otherwise by malware researchers who investigated the matter and concluded that their malicious code is different. The .Jaff file virus copies Locky in more than one way, and uses that as a complementary scare tactic. Jaff is written on the “C” programming language, and its code is far less sophisticated than Locky. Still, that doesn’t exclude the possibility of the two ransomware viruses to share the same author. 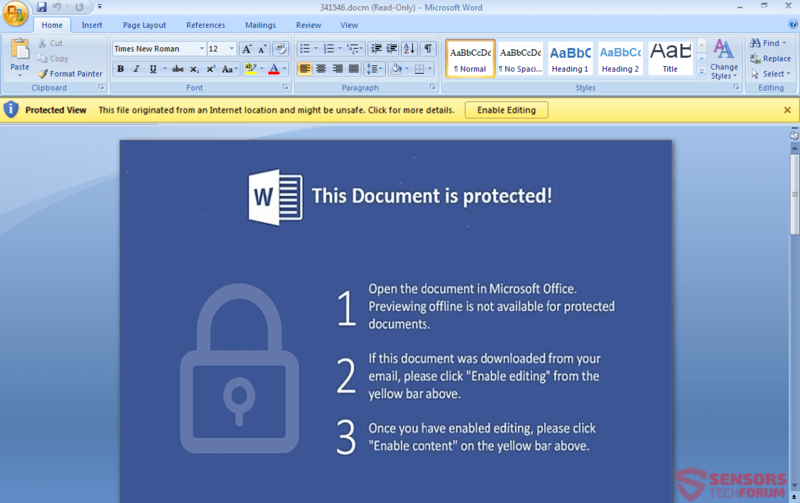 According to Proofpoint researchers, the malware spam campaigns for both viruses are currently spread via the Dridex Trojan, which itself is spread by the Necurs botnet. That’s some food for thought. All three files will have almost exactly the same contents. 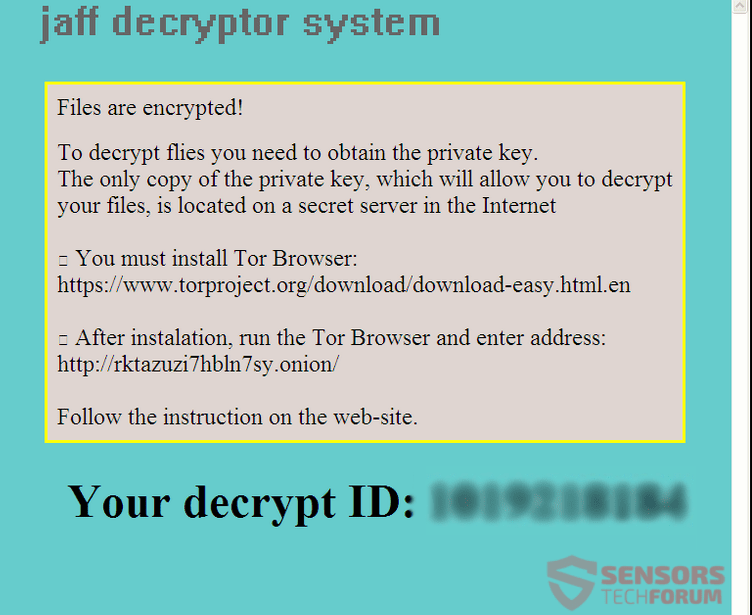 The Tor page will have the same design as the one of Locky, but with some minor difference. How to buy jaff decryptor™? You can make a payment with BitCoins, there are many methods to get them. Purchasing Bitcoins, although it’s not yet easy to buy bitcoins, it’s getting simpler every day. localbitcoins.com (WU) Buy Bitcoins with Western Union. coincafe.com Recommended for fast, simple service. Payment Methods: Western Union, Bank of America, Cash by FedEx, Moneygram, Money Order. In NYC: Bitcoin ATM, in person. localbitcoins.com Service allows you to search for people in your community willing to sell bitcoins to you directly. cex.io Buy Bitcoins with VISA/MASTERCARD or wire transfer. btcdirect.eu The best for Europe. bitquick.co Buy Bitcoins instantly for cash. howtobuybitcoins.info An international directory of bitcoin exchanges. coinjar.com CoinJar allows direct bitcoin purchases on their site. Apparently the .Jaff File Virus demands you to pay 1.82 Bitcoin, which equals to 3.382 US dollars at the moment of writing this article. Despite that, you should NOT under any circumstances pay the ransom of the cybercriminals. Nobody can guarantee that you will get your files restored from paying, nor that you won’t get your computer infected again in the future. Providing money to these criminals will motivate them further in the creation of more ransomware viruses. Each one of the files that gets encrypted will receive the same extension appended to them, and that is the .Jaff extension. The encryption algorithms which are utilized by the ransomware are believed to be AES and RSA. If the command above is executed, it will make decryption efforts harder, if you try to use a recovery method that involves the Shadow Volume Copies. Continue reading and see in what ways the potential restoration of your files could work. If your computer got infected with the Jaff ransomware virus, you should have a bit of experience in removing malware. You should get rid of this ransomware as quickly as possible before it can have the chance to spread further and infect other computers. You should remove the ransomware and follow the step-by-step instructions guide provided below. Threats such as .Jaff File Virus may be persistent. They tend to re-appear if not fully deleted. A malware removal tool like Combo Cleaner will help you to remove malicious programs, saving you the time and the struggle of tracking down numerous malicious files. Threats such as .Jaff File Virus may be persistent on your system. They tend to re-appear if not fully deleted. A malware removal tool like SpyHunter will help you to remove malicious programs, saving you the time and the struggle of tracking down numerous malicious files. Note! Your computer system may be affected by .Jaff File Virus and other threats. SpyHunter is a powerful malware removal tool designed to help users with in-depth system security analysis, detection and removal of threats such as .Jaff File Virus. 1. Install SpyHunter to scan for .Jaff File Virus and remove them. 2. Scan with SpyHunter, Detect and Remove .Jaff File Virus. Ransomware infections and .Jaff File Virus aim to encrypt your files using an encryption algorithm which may be very difficult to decrypt. This is why we have suggested several alternative methods that may help you go around direct decryption and try to restore your files. Bear in mind that these methods may not be 100% effective but may also help you a little or a lot in different situations. Note! Your computer system may be affected by .Jaff File Virus or other threats. Remove .Jaff File Virus by cleaning your Browser and Registry. Fix registry entries created by .Jaff File Virus on your PC. Combo Cleaner is a powerful malware removal tool designed to help users with in-depth system security analysis, detection and removal of threats such as .Jaff File Virus. Step 5: In the Applications menu, look for any suspicious app or an app with a name, similar or identical to .Jaff File Virus. If you find it, right-click on the app and select “Move to Trash”. Step 6: Select Accounts, after which click on the Login Items preference. Your Mac will then show you a list of items that start automatically when you log in. Look for any suspicious apps identical or similar to .Jaff File Virus. Check the app you want to stop from running automatically and then select on the Minus (“–“) icon to hide it. Remove .Jaff File Virus – related extensions from your Mac’s browsers. A pop-up window will appear asking for confirmation to uninstall the extension. Select ‘Uninstall’ again, and the .Jaff File Virus will be removed. When you are facing problems on your Mac as a result of unwanted scripts and programs such as .Jaff File Virus, the recommended way of eliminating the threat is by using an anti-malware program. Combo Cleaner offers advanced security features along with other modules that will improve your Mac’s security and protect it in the future. Hey !, I found this information for you: ".Jaff File Virus Removal (Restore Files)". Here is the website link: https://sensorstechforum.com/jaff-file-virus-removal-restore-files/. Thank you.